During family therapy, be an example of active listening. Not only should you be an example of it, but you should acknowledge [and praise] your daughter when she is doing it. As you hold important boundaries for your daughter, it gives her consistency in order to feel safe. That safety translates into unconditional love. Safety and love are closely united. For example, when you hold boundaries during visits with your daughter (at the program or on home visits) it shows your daughter that you respect the program. This translates into your daughter’s success in the program. As you consistently hold boundaries, you show your daughter how much effort you are willing to put into building her success. You might be scared to hold certain boundaries for fear of damaging your relationship with your daughter. As you CONSISTENTLY hold boundaries, you give your daughter a sense of certainty to know what to expect from you. It also clearly explains what you expect from her. By doing this you are creating stability in her life. Consistency leads to stability, which offers an environment of physical and emotional safety for her to belong to. When you challenge your daughter you are ultimately showing her love and that you believe she has the ability to grow beyond her current circumstance. Actively engage your daughter by supporting her as she works hard and pushes herself to do better. Be specific in why you are pushing your daughter to go the extra mile. It is easy for our teen daughters to misinterpret our intentions if we do not convey what those intentions are. We must have a sturdy foundation in our relationships in order to build on and test them. Teach your daughter to be happy and accepting of who she is. But also teach her that there is always opportunity for growth. As you practice active listening, validating and remain consistent in your expectations, your daughter will be more willing to accept the challenges you extend to her. Those are hard things to do! It is hard to communicate as a teen. It is very hard for girls to live in the community. Girls think that parents have no idea how hard it is to live here. Knowing that you appreciate her and her efforts helps her feel loved. By expressing gratitude, you are offering reassurance to your daughter that her current efforts have not gone unnoticed. You cannot push her to do better if you do not also reassure her that you appreciate her, that you are aware of the efforts she is already making. When you express gratitude, you automatically have a positive interaction with your daughter. Be mindful of these interactions. Make sure you have at least 5 positive interactions for every challenging interaction. Active listening, validation, boundaries, challenging, and gratitude help you connect with your daughter on a deeper level. They facilitate growth resulting in greater confidence and increased capabilities. 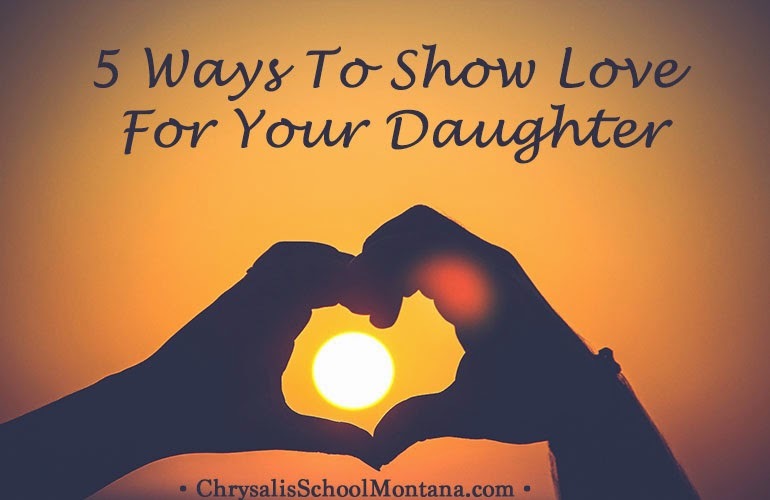 What are your favorite ways to celebrate and show love to your daughter?